Johnny Sexton has opened up about the work that went into the formulation of the lineout play that gave Ireland a 14-0 lead in their Grand Slam winning performance at Twickenham on Saturday. Garry Ringrose's sixth minute try and CJ Stander's 24th minute effort gave Ireland a commanding lead in the first half of last weekend's crucial encounter and with the second score coming about as the result of a planned move the team had been practicing in the lead-up to the game. 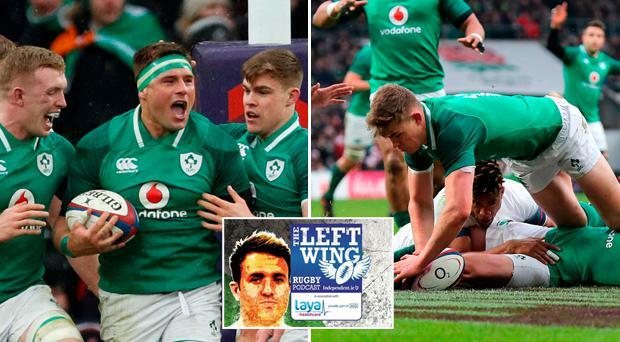 Speaking as a special guest on The Left Wing with Luke Fitzgerald in association with Laya Healthcare, the Ireland flyhalf revealed that he had planned to use the creative move earlier in the game but went for the garryowen instead that led to Ringrose's score. "We had planned to play it. It was definitely one of our 'go to' plays in that area of the pitch. We had actually called it at the start of the game," he said. "When we won the lineout it was scrappy and that's when we put up the kick for Rob when Anthony Watson was by himself back there. "It was called earlier and we didn't get a chance to do it but the next lineout we called it and it worked a treat." The move for Stander's five-pointed was shrewdly devised with Ireland faking a wraparound move between Sexton and Tadhg Furlong with the tighthead prop ignoring his number 10 to transfer the ball to Bundee Aki who streaked through a gap before he released it to the number 8 to score at the base of the post. "It was something that we scouted with England a few years ago, They like to read that wraparound and they ran out the other side of it and we snook Bundee through. It was very pleasing that he worked on it very hard... obviously Joe is big into his detail. We'd run it loads and loads of times during the week," he added. Sexton believes using Furlong as the fulcrum for the move was crucial for its success. "It's quite clever isn't it? A very high-skilled prop but it's natural for the opposition to think that he's just going to stand and pivot it back to the 10. "A big part of the play was using someone that you wouldn't think had such skill. "Tadhg had worked on it very hard during the week to be able to perfect the transfer and that's what makes the move really. There are a lot of different parts that go to it too, different running lines away from the ball that a lot of other people wouldn't even see that make a huge difference in dragging other people out of the way. "We did it really but I'm not sure if Joe will be happy. I'm sure he'll be happy but he'll probably find something wrong with it but he'll be happy that we got the score from it and it contributed to a big part of the result I think." Sexton and Fitzgerald spoke about how Leinster would utilise these moves in big games during Schmidt's time at Leinster and used a perfectly executed try they scored against the Cardiff Blues. "At different stages, and Luke would tell you, we've had success with Joe as coach. You'll remember the move Luke when we set up Brian to score against Cardiff and we must have ran it 10 times during the week and Joe wasn't happy with it. "We had practiced it so many times and it's so pleasing when you can pull it out and do it well on the big stage. A lot of work does go into those type of things."